At WebFX, we monitor about 1,500 different Google Analytics profiles across a large number of different industries. This allows us to do some in-depth analysis based on all the data we can bring in. We’ve already analyzed search engine usage and (not provided). Upon seeing the recent buzz about Comcast buying out Time Warner Cable, we decided to examine how large of an impact this would have on the ISP landscape. Using more than 56 million visits from 2013, we took a look into the current ISP outlook. Below is what we learned about the ISP marketshare. Check it out! From the 56 million visits, we discovered the top ISP in every single state. In relation to the overall visits per state, we then determined the overall market share of each service provider. This revealed several different interesting areas that are important to note, especially while Comcast discusses the buyout of Time Warner Cable. Some states were broken up fairly evenly between ISPs, and others were completely dominated by one main service provider. Let’s lay out some more of the data. 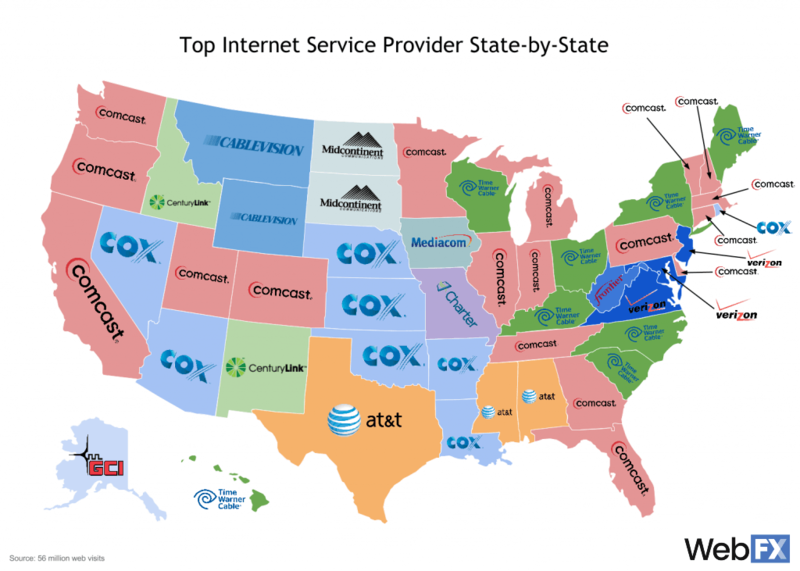 Each and every one of these different Internet service providers occupy a different amount of market share in each state though. Some states are fairly balanced, but some certainly make you raise your eyebrows. Below we have provided a handy interactive map of the ISP market for you to check out. Each state is highlighted with increasingly intensified colors the more market share that top company occupies. If you click on an individual state, the most prominent ISP is shown with it’s current market share. Feel free to zoom in and out and click around the map! The lighter/greenish states are the least controlled by any one service provider. This allows more people to pick the ISP of their choice and means they quite possibly are offered better prices in a competitive market. However, if you live in one of the darker red areas, this indicates that one company seems to have a stronger hold on the market. The state that is controlled the most by one company is, well, Alaska. While normally this might be an issue, Alaska doesn’t have nearly as many companies fighting over market share to begin with. However, other states with a company occupying more than 40% market share demonstrate an ISP that might have some kind of influence over that market. By definition, this doesn’t at all present a monopoly, but it still might trigger some frustration from customers in those areas due to dominance from any one of these top ISPs. As you can see, Comcast is already the largest ISP. However, when we add each state that TWC already dominated as well as the market share of TWC in other states, we have a whole different story. 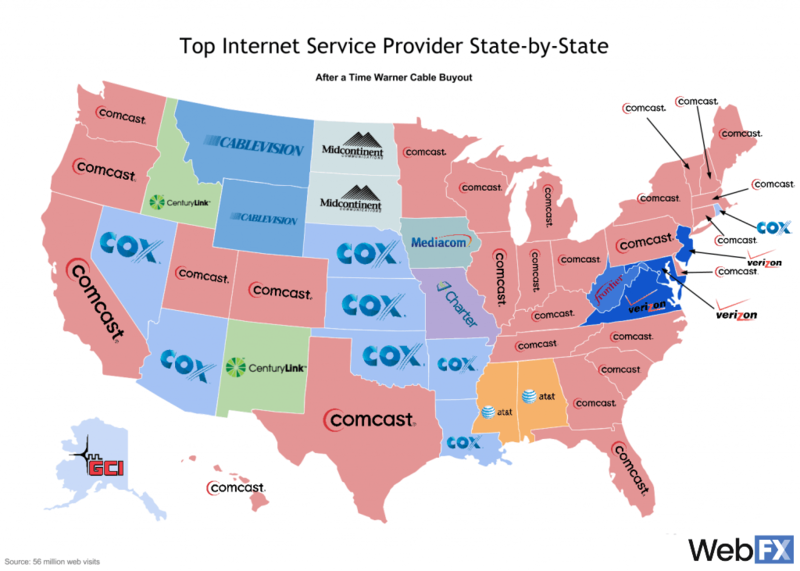 Now you can see that nearly the entire East coast is dominated by Comcast. In fact, only four out of the fourteen East coast states would keep their existing top ISP after this big deal goes through. The list of states is bumped up to 27 with the addition of Texas, South Carolina, Maine, Kentucky, Ohio, New York, Wisconsin, North Carolina, and Hawaii. Here is another interactive map to browse. Note the % Change for any of the Comcast states (% Change is only shown for states posting Comcast as the top ISP). 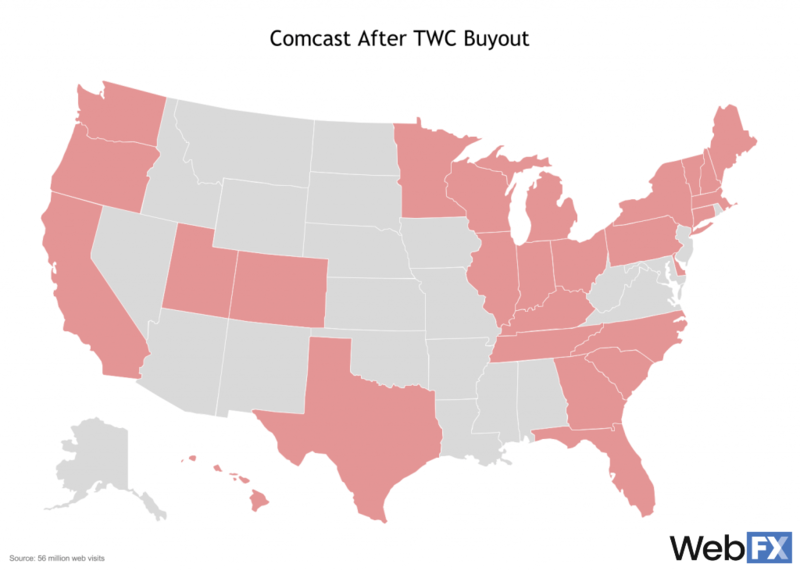 The biggest win for Comcast here is clearly with Florida, by nearly doubling their former market share. By buying TWC in South Carolina they automatically bump up to the number one spot as well. Additionally, neither Comcast nor TWC was a top ISP for Texas, but the two combined allow it to take over the top spot. Excluding South Carolina, Comcast originally didn’t have a strong presence where TWC previously controlled top ISP position. Upon buying TWC in Maine, Kentucky, Ohio, New York, Wisconsin, North Carolina, and Hawaii, Comcast jumps from being a lowly competitor to a force to be reasoned with. 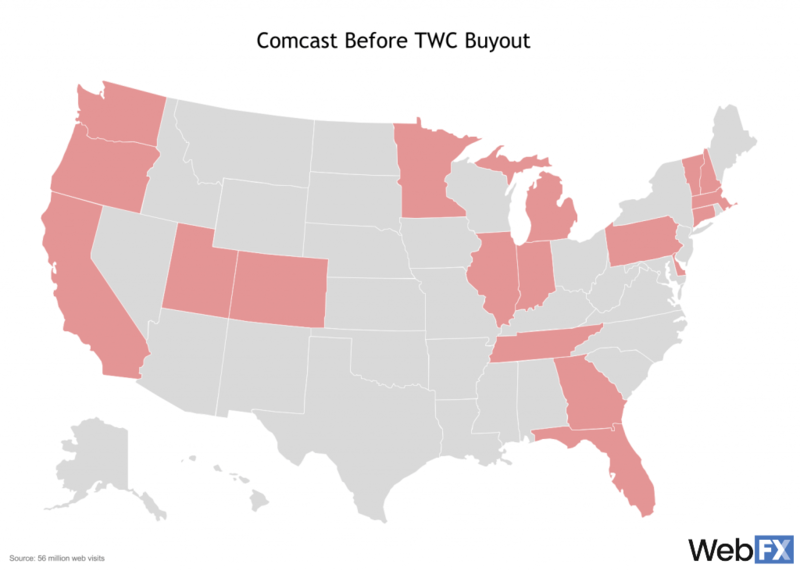 These might be the states that will see the most change as a result of this buyout. While Comcast is certainly a hot topic at this point in time, there are other major ISPs that presently own a large share of the market. The maps above merely represent huge variations of service providers throughout the country. A city-by-city breakdown might represent an even more diverse conglomeration of Internet service providers while worldwide analysis might present a whole host of different issues at hand. While the FCC has the final say about this deal, it is still important to look at the current scope of the market. As it is, users may not be able to choose their current ISP already, even if it isn’t Comcast. This entire situation may not change much for anyone at all. Needless to say, the data we have found in this analysis is indicative of the industry’s growth. Technology continues to grow at an exponential rate and without an Internet connection, our access to big data, social interactions, mobile conveniences, content management systems, and cloud storage is severely limited. As the years go by, Internet service providers’ inelasticity is greatly increased as our world’s advancements continue. No matter what happens with any mergers and buyouts, we will still need (and pay for) an Internet connection. Disclaimer: The data presented here was a small sample of the United States’ total web visits. While we were able to base our analysis off of more than 56 million web visits, that still might not reflect 100% accurate results. The data might not hold up in a court of law, but it still presents current trends in the ISP industry markets.